This episode is the recording of November’s live Q&A. These Q&A sessions take place the second Tuesday of every month. The questions answered in this episode were submitted by listeners of this podcast, both ahead of time and live. I am joined on this episode by Brendan Mahan. In this discussion, you will hear Brendan, and I answer several questions from diagnosis and medication to refocusing after interruption, overwhelm by digital tools, and everything in-between. You’re welcome to join these monthly live Q&A sessions. They take place the second Tuesday of every month at 12:30pm. Go to http://erictivers.com/events. [05:52] – Colleen asks about fish oil and other supplements. [10:25] – Beth asks for tips on getting diagnosed with ADHD. We share tips and warnings about the diagnosis process. [15:20] – Catalina asked if medication should help with organizing your space. [21:02] – Catalina follows up with a question about medication dosage. We also talk about medication and insurance costs. [24:30] – Dmitri asks about emotional control and disruptions. Brendan talks about the role that mindfulness plays in controlling emotions. 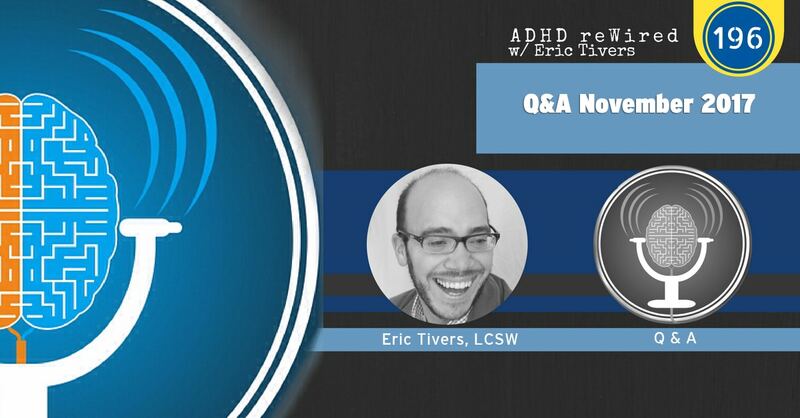 [36:44] – We answer two questions that are similar on procrastination and taking control of our lives away from ADHD. We discuss this topic in regards to interviews. [47:59] – Deborah was part of an ADHD reWired Coaching and Accountability Group and asks what her follow-up should be after the group. I share that I am building a community for alumni. [52:57] – Olivia asks how to assist her 19-year-old son with life decisions. [57:13] – We answer a question about refocusing after interruptions. Brendan explains that the process starts with avoiding interruption. [1:03:46] – Carl has trouble differentiating between his thoughts and ADHD thoughts. Brendan states that he draws the line at useful thoughts and unuseful thoughts. [1:04:22] – A questioner is looking to avoid overwhelm by digital tools. [1:05:48] – A listener asks how to explain ADHD to others. Our 200th episode is coming up, and I’d like you to be a part of it. Do you have a great ADHD story, poem, or song? It could be funny, triumphant, inspiring, or even cringe-worthy. Record yourself using a voice recording or memo app on your smartphone. Submissions are due no later than December 19th. You can email me the mp3 file at Eric@EricTivers.com and put “#200” in the subject line.